In this tutorial we will learn How to Install and Configure Google's Android Studio, the official tool for developing Android applications. Following are the steps you need to do in order to Install Android Studio in Ubuntu (Any version of Ubuntu Linux including Ubuntu 16.04 and 14.04). 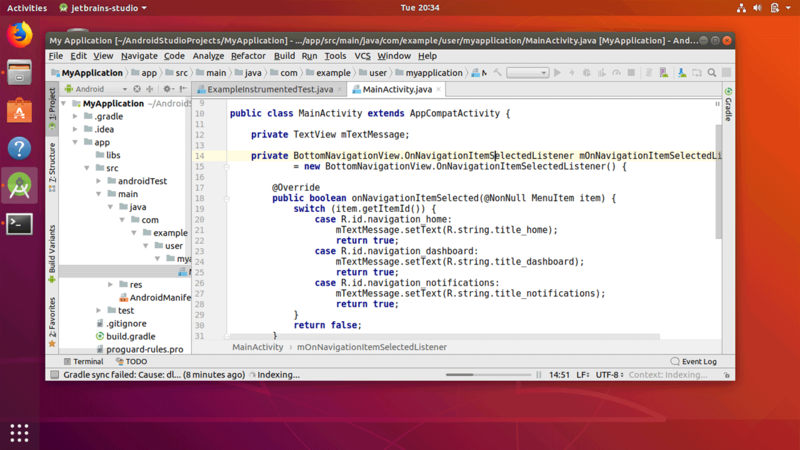 Download Android Studio for Ubuntu. Unzip zip file to the /opt directory. Create Desktop Entry for Ubuntu Application Menu. The latest version of the Android Studio comes bundled with OpenJDK, so you don't need to install Java Development Kit separately in your Ubuntu 18.04 desktop. To download android studio, go to following URL https://developer.android.com/studio/index.html and download the latest package for Linux. The android studio for Linux comes as a .zip file. To start setup wizard, we need to run studio.sh script from the bin directory of the unzipped folder. This will launch the setup wizard for the Ubuntu Android Studio. Continue with the default options to install and configure Android Studio in Ubuntu 18.04. One more thing, We need to add Android Studio to the Ubuntu application menu. To create a desktop entry, click on Configure and select "Create Desktop Entry" (Or from the Top navigation, Go to Tools and select "Create Desktop Entry"). And that's it!! Now you have the Google Android Studio, Integrated Development Environment on your Ubuntu 18.04 desktop.